I feel like I've been neglecting my blog lately. It's not that I'm having a creativity crisis - quite the contrary. I'm currently working on something that MUST be done by tomorrow! Actually, three things must be done by tomorrow...maybe I'll just forget about sleeping tonight :) Couple my over-achievements with a recently mobile (and teething) baby and you've got a recipe for blog neglect. Since I can't post my latest efforts until next week, I'll tack up something that I finished a little while ago. I really love this sweater vest; it's so grown-up! 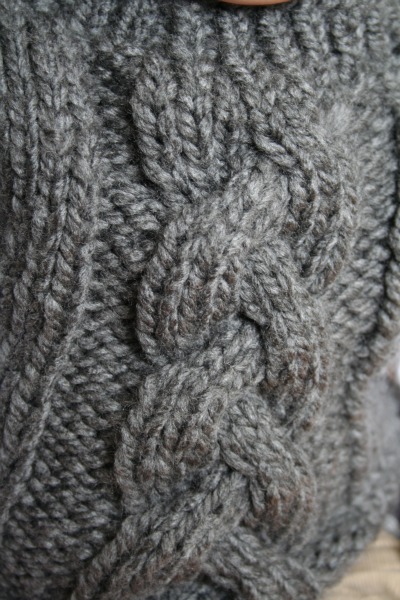 It was a pretty easy pattern and knit up very fast because it used bulky yarn and large needles. I love a quick, satisfying (and uber cute) project. I just wish I had some seasonal forethought. 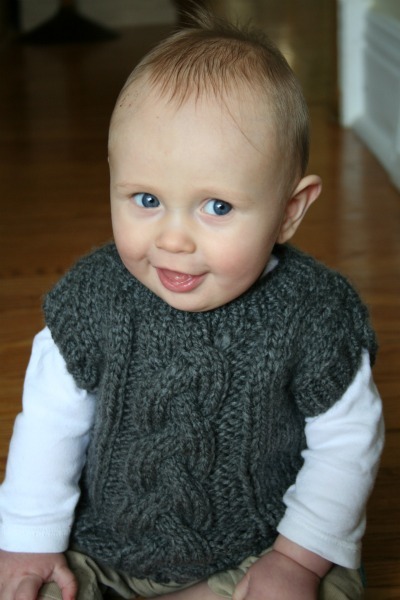 I made sure I knit it large enough so that Rowan would be able to wear it a few times - but I failed to account for the spring weather that is approaching. He'll just have to wear it every other day until it's too warm. It's officially spring at our house when the windows are left open for most of the day. 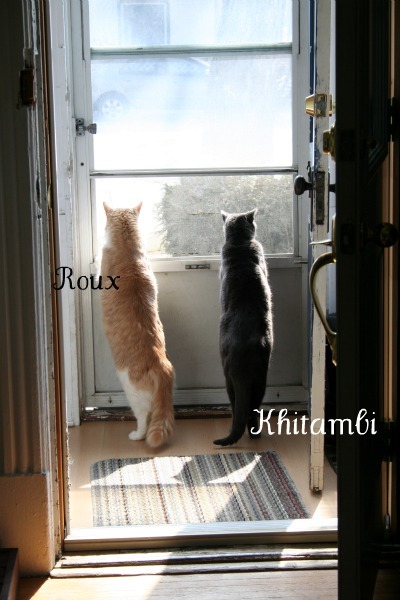 The cats are strictly indoor animals, so they love to sniff the fresh air. We're off to my brother's wedding this weekend. Very excited to gain a sister and a niece on Sunday!! I love this blog: the combinations you make are always interesting. IN this case, the very sweet cable vest on a very mischievous looking little grinner and the spring connection via the cat photo. You have captured one of my favourite days of the year, the first day to open windows in spring and my other is often on the same day or one close by and that is the first day in the spring to hang laundry on the line, obviously assuming I stopped hanging out all winter which is a bit of a wimpy thing to do. Love your blogs. love the vest! 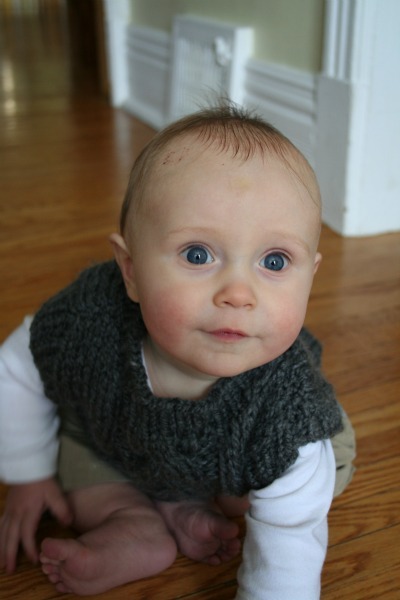 Rowan will appreciate all the the hand knits as he grows!!!! great Job!